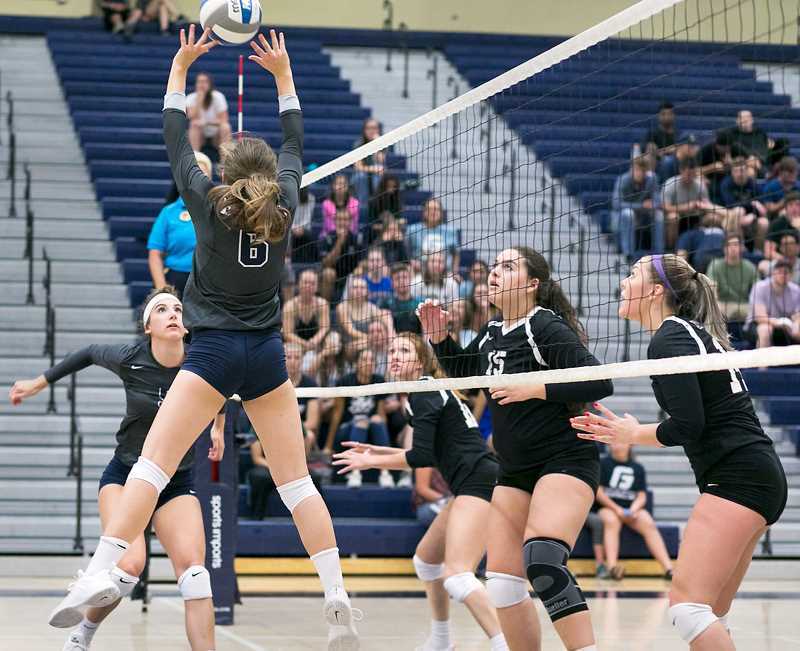 After losing three of its first four Northwest Conference matches in five sets, the George Fox volleyball team finally got over the hump Friday night in a 3-1 home win over rival Linfield. The Bruins took the first set 25-20 before the Wildcats leveled the match with a 25-10 victory in the second. George Fox seized control by taking the third 25-18 and survived a back-and-forth affair in the fourth, winning 25-22 to claim the victory. Laney Search was all over the court for the Bruins, racking up 16 assists, six kills, six digs and an ace. Despite 13 kills apiece from Liv Alexander and Page O'Rear, the Bruins (7-7, 1-5 NWC) could not keep up their momentum Saturday night and fell 3-2 at Lewis & Clark (9-4, 2-4). The Bruins will travel to play Pacific Lutheran Friday. Pacific 19, George Fox 13 (OT) – The Boxers returned a fumble for a touchdown in the third quarter and kicked a 26-yard field goal in the fourth to force overtime. Pacific (2-2, 1-0 NWC) then blocked a George Fox field goal attempt in overtime before securing the home win on a six-yard touchdown pass from JT Greenough to Ty Hargis. Wesley Riddell rushed for 73 yards on 16 carries to lead the Bruin offense. DII National Preview – The Bruins shot matching rounds of 308 to place second at 616, three strokes behind winner Grinnell (613). Iris Kawada followed her opening-round 79 with a 1-over-par 73 to move up 17 spots and finish in a tie for fifth at 152. Kayle Hunn was one shot back in a tie for seventh at 152 after rounds of 78 and 75. The Bruins will host the Culturame Classic Saturday and Sunday at Willamette Valley Country Club in Canby.